Germany is hungry for information about what to expect from the Trump administration. Will President Trump withdraw the United States from the Iran deal and the Paris agreement? Will he let Vladimir Putin run rampant in Eastern Europe? Will he continue to provoke China? Will he tweet at four in the morning to announce policy proposals? Detlef Wachter, head of the division of security policy at the Federal Chancellery, said Germany is extremely anxious to see how the new U.S. administration will interact with Putin’s Russia. Though Trump’s campaign statements about NATO caused some alarm in Germany, they did reignite a discussion about burden-sharing among NATO members. Germany, for its part, does want to adhere to its commitment of spending 2 percent of its GDP on defense, according to several officials. Germany currently spends 1.19 percent. At the German Council on Foreign Relations (DGAP), an independent, non-partisan, and nonprofit membership organization, think tank, and publisher, Dr. Jana Puglierin, head of the Alfred von Oppenheim Center for European Policy Studies program, and other DGAP experts said that following Russia’s interference in the U.S. presidential election, Europeans are very anxious about the same thing happening during France’s election in May and Germany’s election in September. Professor Dr. Andrea Römmele of the Hertie School of Governance in Berlin questioned the role of mainstream media following the U.S. election. "In the United States, all major media outlets endorsed Clinton, but Trump used tweets and won," she said. "What’s the relevance of the media now?" Bertram Eisenhauer, head of the Sunday edition of Frankfurter Allgemeine Zeitung (FAZ), one of the largest newspapers in Europe, said there’s a growing distrust of the media in Germany, just like in the United States. He mentioned the increasing use of the term "lugenpresse," or lying press, a term successfully used by the Nazis to fight the media in the 1930s and used again by some Trump supporters during the 2016 presidential campaign. "There is a broad movement of people now who do not believe anything they read in the paper unless it confirms certain preconceptions they have," said Eisenhauer. "If you say crime is rising because of the refugees, they will believe it, but if you say crime is not rising, they will think you’re lying." Nora Müller, executive director of international affairs at the Körber Foundation, said policymakers in Berlin are overwhelmed by the expectations of other countries these days. Matthias Nass, chief international correspondent of Die Zeit, the largest weekly newspaper in Europe, agreed. "Transatlantic relations are getting very interesting again," he said. "The German government was not prepared for the outcome of the U.S. election. We do not know what to expect from the Trump administration. But whoever the leaders are, the United States and Europe have to work together. We face these challenges together." Nass said it’s important for Europe to know if the Trump administration wants to continue having Germany and France be the drivers of the Minsk talks, or if he wants the United States to take over talking to Russia about Ukraine. "We hope the United States lives up to its obligations, treaties, and agreements, and we need to do that, too," he said. "There has to be trust on both sides. This doesn’t exist yet. Europe is not in a good state right now. We have a rise of nationalism that I didn’t expect in my lifetime. Many players look to Germany with high expectations, but America can’t expect Germany to take a lead that is not coordinated by all our neighbors. We don’t speak for Europe. Berlin might have a strong voice, but it is only one of 28 voices." Germans and their government are very reluctant to build up their military and to use force abroad. Kapitän zur See Hans-Jörg Detlefsen, deputy director of security policy at the Ministry of Defense, went so far as to say Germany is reluctant to commit troops to UN peacekeeping forces. Pacifism is a long-standing tradition in German society, due in no small part to World War II. If the United States, under President Trump, becomes more isolationist and withdraws from the Middle East, Germany will not and cannot fill that gap, officials said. Germany is also not immune to the populist trends shaking up the establishment around the world, including in the United States with the election of Trump, in the United Kingdom with the Brexit vote, in Italy with the rejection of Prime Minister Matteo Renzi’s reform referendum, in the Philippines with the election of Rodrigo Duterte, and in Colombia with the rejection of the first peace deal with FARC rebels, to cite a few examples. 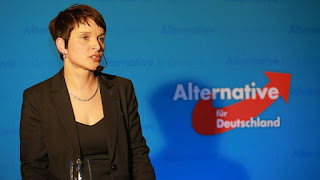 A new far right-wing populist and Euroskeptic political party called Alternative für Deutschland (Alternative for Germany, AfD) is gaining traction in Germany. AfD has won seats in several state parliaments and is expected to win anywhere from 5 to 12 percent of the seats in the national parliament in September 2017. The party was formed a couple of years ago in opposition to the euro, but quickly adopted a xenophobic, anti-immigrant platform in response to the influx of refugees in Germany. On December 6, German Chancellor Angela Merkel delivered a speech to the annual conference of her party, the Christian Democratic Union, in which she accepted her party’s nomination as its candidate for another four-year term, called for a ban on full-face veils, and moved to the right on refugees. "A situation like the one in the late summer of 2015 cannot, should not, and must not be repeated," she said, referring to terrorist attacks allegedly carried out by refugees. Another string of attacks were carried out in summer 2016, and in December a truck ploughed through a Christmas market in Berlin, killing 12 people. The Islamic State claimed responsibility for the attack. Merkel has received criticism for opening the door to over a million refugees, but many Germans are still supportive of hosting and integrating refugees into their society. At the Hamburg Chamber of Crafts, a nonprofit corporation under public law that provides services to the skilled crafts sector, Securing Skilled Workers department head Gesine Keßler-Mohr said incoming refugees help counter the low birth rate and aging population problem in Germany, which is one of the lowest in Europe. "There is a deep, ongoing discussion about the value of immigration and how it will change German society," she said. Eisenhauer spoke about his newspaper’s struggle to cover a recent controversial story about an 18-year-old German college student who was raped and strangled to death in a small university town, allegedly by a 17-year-old unaccompanied minor and former refugee from Afghanistan applying for asylum in Germany. "Is this a regional story? A political story? Should it go on page one? Should we make the connection to the refugees coming in? Will our coverage fan the flames of xenophobia?" said Eisenhauer, describing the discussion in their newsroom about how to cover the story. They ultimately decided not to put it on page one, but displayed it prominently inside the paper. The Chamber of Crafts and Chamber of Commerce are deeply involved in the effort to integrate refugees into the German labor market by providing vocational training, language classes, cross-cultural competence training, and other services to make sure refugees have the necessary qualifications to do the jobs they are being assigned to. The German government’s foreign policy, under Merkel’s leadership, is focused on thinking more comprehensively about solving problems in regions such as the Middle East and North Africa before refugees leave those areas and head for Europe. They hope that the Trump administration sees the value in this strategy and that the United States follows suit. Pacific Council communications associate Justin Chapman recently traveled to Berlin, Frankfurt, and Hamburg, Germany for the "Think Transatlantic" Study Tour, sponsored by the German Federal Foreign Office. Meetings with government, media, economic, and think tank officials featured discussions on a range of transatlantic issues, including NATO, refugees, Russia, President-elect Donald Trump, and more.